These Chicken Egg Rolls with Hoisin Sweet and Sour Sauce are the best egg rolls ever…takeout or homemade! Chicken Egg Rolls loaded with chopped chicken and veggies smothered in easy Sesame Sauce all fried (or baked) in a in a crispy egg roll wrapper. These egg rolls are 100% addicting and super easy to make by chopping the filling in your food processor AKA no hand chopping! The sesame sauce transports them to a whole new level of YUM. 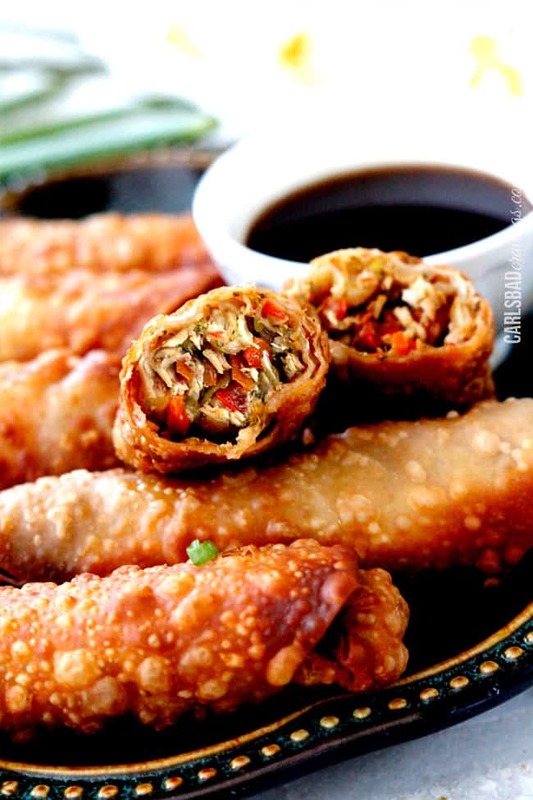 These Chicken Egg Rolls make a fun dinner, crowd pleasing appetizer or in demand snack. They can be baked, fried and frozen for the perfect egg rolls for everyone! 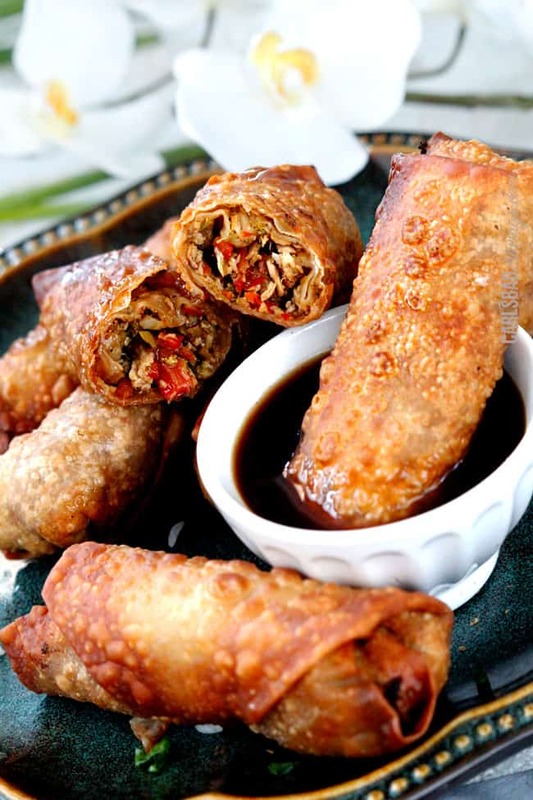 This Chicken Egg Roll Recipe has been compensated by McCormick’s Skillet Sauce®. All opinions are 100% my own. Both Patrick and I are egg roll creators and connoisseurs from Sweet and Sour Chicken Egg Rolls, Southwest Egg Rolls, to Philly Cheesesteak Egg Rolls and now these epic Sesame Chicken Egg Rolls. Egg Rolls are our appetizer of choice to bring to parties – particularly Game Day, New Year’s Eve and Christmas Eve. While all of our egg roll creations have been delicious, these Sesame Chicken Egg Rolls are our favorite ever! Patrick has never asked me to make something more times in one week. In other words, you want to make these chicken egg rolls soon because you are going to fall in love with them! 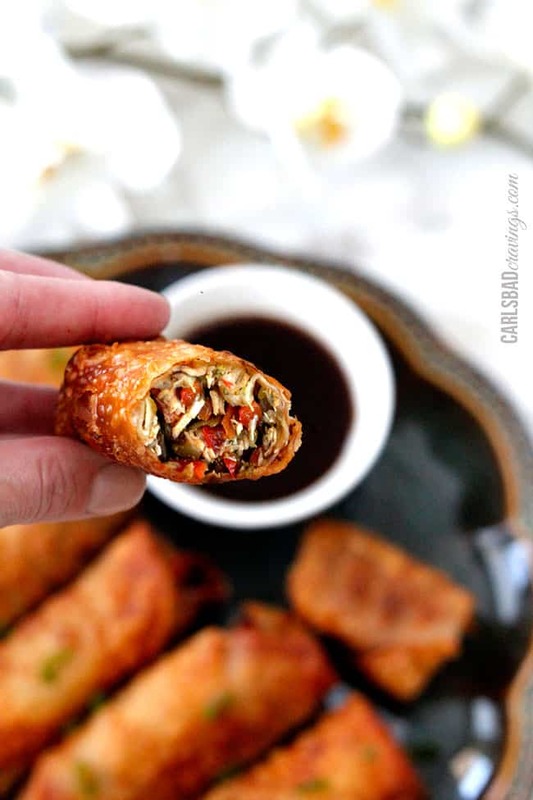 These Chicken Egg Rolls are super quick and easy to make – all you have to do is stir fry the veggies, pour in the sauce and chop in your food processor! That’s right, 10 minutes to a Chicken Egg Roll filling boasting crisp tender vegetables and juicy chicken doused in McCormick’s sesame sauce comprised of soy sauce, pineapple juice, garlic, ginger, paprika, and sesame oil – all you have to add is sriracha, salt and pepper! We are talking serious flavor with minimal effort AKA takeout-fakeout heaven. What Goes in Chicken Egg Rolls? The filling for these Chicken Egg Rolls is super simple and comes together in minutes by using a package of stir fry vegetables and McCormick’s® Sesame Chicken Skillet Sauce®. The vegetables add the crunch and the sesame sauce adds the perfect punch of Asian flavor. Can You Use Rotisserie Chicken? Yes! You will need about 2 1/2 cups shredded rotisserie chicken. CAN YOU USE PORK INSTEAD OF CHICKEN? Absolutely You may substitute the chicken for an equal amount of lean ground pork. Cook the pork until mostly cooked through, then add the vegetables. Take care you drain the pork of excess grease so the filling doesn’t become soggy which will cause your egg roll wrappers to tear. 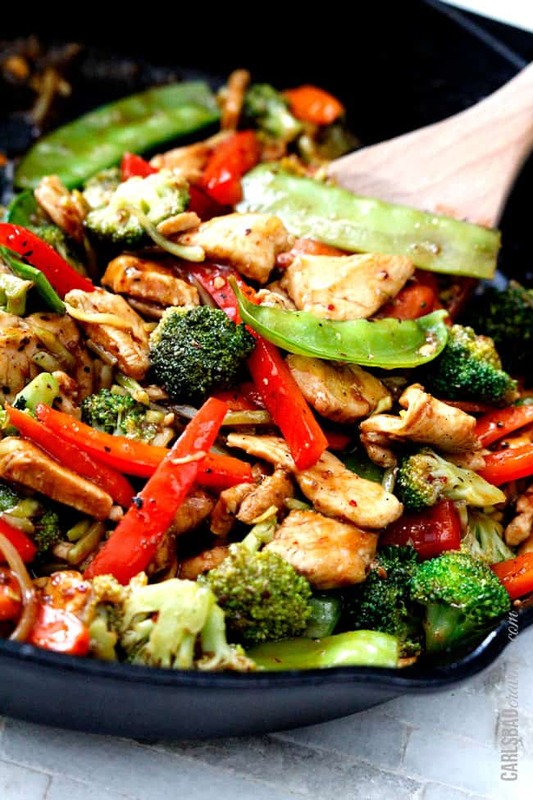 Step 1 – Cook Chicken and Veggies: Cook chicken in a large skillet until opaque but not cooked through, because it will continue to cook with the vegetables. 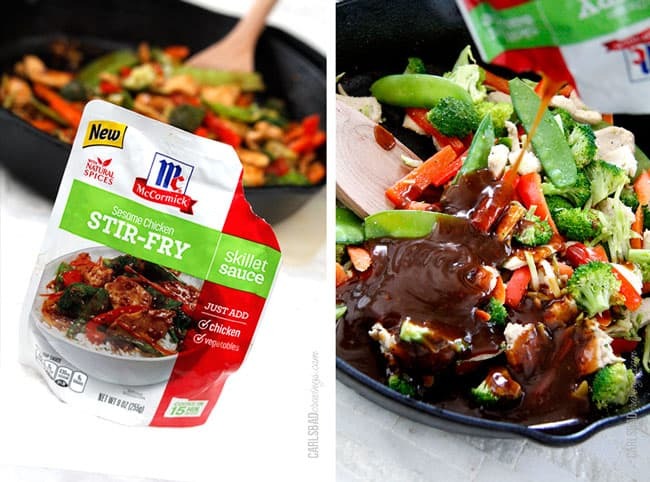 Add vegetables stir fry until crisp-tender. Step 2 – FLAVOR! Stir in the Sesame Sauce and Sriracha and bring to a boil. Reduce heat and simmer 1 minute or until heated through. Season with salt and pepper to taste. 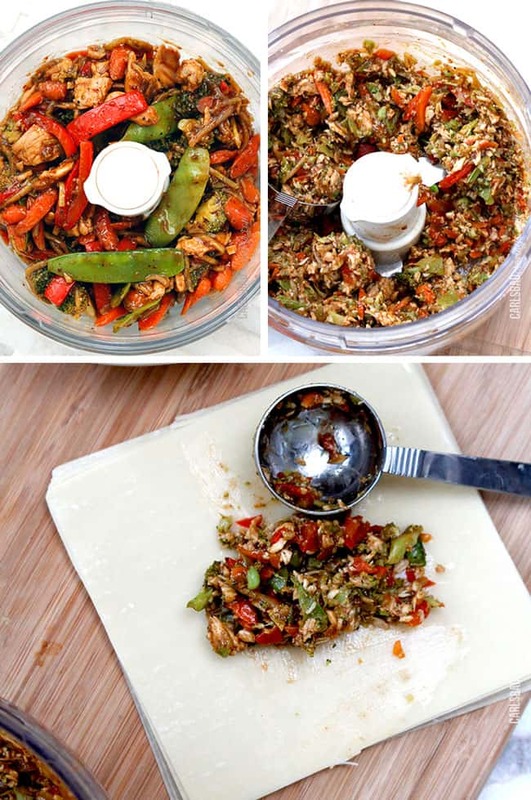 Step 3 – Chop Filling: Using a slotted spoon (you don’t want extra moisture), add chicken/vegetables to your food processor and pulse until finely chopped (about 12 pulses). This creates the perfect filling texture in SECONDS and is the same method I use in my potstickers and Wonton Soup – it is life changing! Step 1 – Prepare Surface: Line your counter with parchment paper to place rolled chicken egg rolls if frying or line a large baking sheet with aluminum foil if baking and lightly spray with nonstick cooking spray. Keep egg roll wrappers covered when you’re not using them so the don’t dry out or else they will dry out and tear easily. Step 2 – Add Filling: Position an egg roll wrapper with one point towards you. Place 2 tablespoons filling in the center. I found this to be the right amount of filling for these egg rolls, but you can add more if you wish and can still easily fold and seal the egg rolls. Step 4 – Seal: Moisten top corner with water and press firmly to seal. Repeat with remaining wrappers and filling. It is important that the chicken egg rolls are completely sealed otherwise oil can seep in and cause them to break while cooking. If you find your egg roll wrappers aren’t sealing, it might be because the edges are too wet – don’t use too much water to seal. We prefer to fry our Chicken Egg Rolls instead of baking them because it is the only way to achieve the tantalizing, shatteringly crunch that is SO satisfying and the defining characteristics of an egg roll! Gently add about 4 chicken egg rolls to to the pot. Don’t overcrowd or the chicken egg rolls won’t cook evenly. Fry egg rolls until golden brown, turning egg rolls a few times while frying. If you find your egg rolls are cooking too quickly and surpassing the golden brown, then lower heat. Line chicken egg rolls, seam side down, on baking sheet, so that they are not touching. Chicken Egg rolls are the crispiest when eaten fresh, but you can reheat the leftovers. To reheat Chicken Egg Rolls, line them on a baking sheet and bake for 15-20 minutes at 350 degrees or until heated through. Prepare and cook Chicken Egg Rolls according to directions. When ready to serve, either fry as before straight out of the freezer (don’t defrost), OR bake from frozen per instructions, adding about 5 minutes to baking time. CAN YOU MAKE EGG ROLLS IN ADVANCE? You can either bake and fry your Chicken Egg Rolls and freeze OR make the filling, cover and refrigerate until ready to assemble egg rolls. You cannot assemble the Chicken Egg Rolls in advance without cooking or else the wrappers will become soggy and tear. WHAT DIP SHOULD I SERVE WITH EGG ROLLS? Now please, make these Sesame Chicken Egg Rolls with Hoisin Sweet and Sour Sauce – soon. And be prepared to stock up on sesame skillet sauce, because trust me, your family/friends are going to be begging you to make these again and again and again. And I guarantee you will be more than happy to oblige, because YOU want to eat these Chicken Egg Rolls again -soon – very soon. 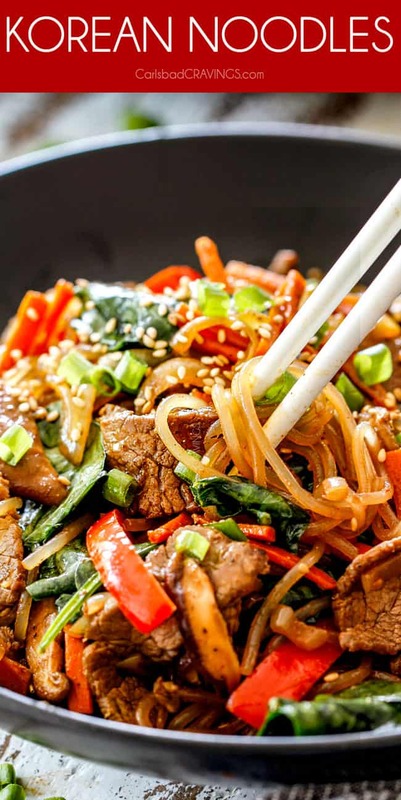 Looking for more Asian Fake out Takeout Recipes? WANT TO TRY THIS CHICKEN EGG ROLL RECIPE? 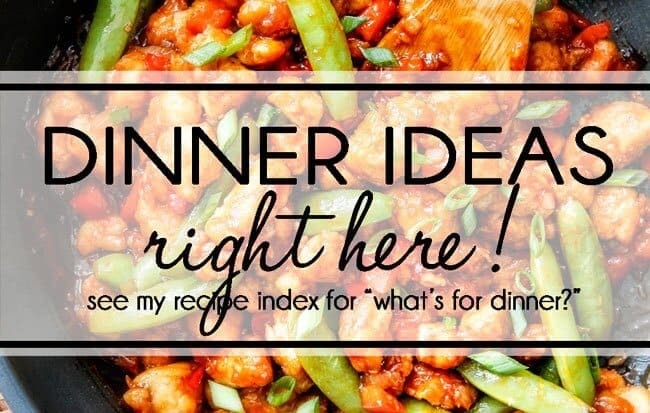 PIN IT TO YOUR ASIAN, CHICKEN OR APPETIZER BOARD TO SAVE FOR LATER! These Chicken Egg Rolls with Hoisin Sweet and Sour Sauce are the best egg rolls ever...takeout or homemade! These homemade egg rolls are super easy to make by chopping the filling in your food processor AKA no hand chopping! The sesame sauce transports them to a whole new level of YUM. These Chicken Egg Rolls make a fun dinner, crowd pleasing appetizer or in demand snack. They can be baked, fried and frozen for the perfect egg rolls for everyone! Whisk together Hoisin Sweet and Sour Sauce ingredients until well combined. Set aside in refrigerator. In a large skillet, heat 1 tablespoon oil over high heat. Add chicken and cook until browned, but not cooked through, approximately 1-2 minutes. Add vegetables and saute over medium-high heat until vegetables are crisp-tender and chicken is cooked through, approximately 2-3 minutes. Stir in Sesame Sauce and Sriracha and bring to a boil. Reduce heat and simmer 1 minute or until heated through. Season with salt and pepper to taste. Using a slotted spoon (you don’t want extra moisture), add chicken/vegetables to your food processor and pulse until finely chopped (about 12 pulses). Position an egg roll wrapper with one point towards you. Place 2 tablespoons filling in the center. Fold bottom corner over filling then continue to roll up, firmly folding sides toward center over filling as you roll. Moisten top corner with water and press firmly to seal. Repeat with remaining wrappers and filling. (Refer to your egg roll wrapper for a diagram). Heat oil in a stock pot or deep-fat fryer to 350F degrees or medium high heat. Fry egg rolls, 4 at a time until golden brown, turning egg rolls a few times while frying. Drain on paper towels. For the Hoisin Sweet and Sour Sauce you can either whisk all of the ingredients together except for the cornstarch for a thin dipping sauce OR you can add all of the sauce ingredients, including the cornstarch, to a small saucepan and simmer until thickened. *Slice carrots and cut broccoli into bite size pieces if still whole. **Hoisin Sauce can be found in all grocery stores in the Asian section. All Hoisin Sauce is NOT created equal. Many brands contain too much 5 Spice. I highly recommend Lee Kum Kee Brand (this is NOT an affiliate link, just my personal preference). Do you have any tips on filling the rolls? 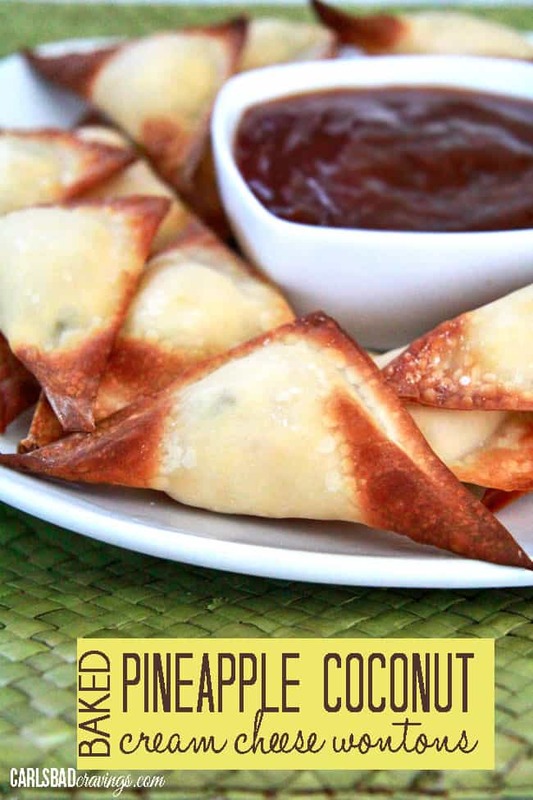 I have tried a couple of times to make egg rolls and they are always sort of….lacking. I just can’t seem to get enough filling packed into them the way they do in restaurants. I know that practice should help but thus far it has not 😛 Thanks! Hi Michelle! I think the restaurant egg rollers are experts! The biggest tip I can think of is to to wrap the roll around the filling as tightly as possible that way no matter how much filling you use, it feels full because it is encased so tightly. Other than that, I think its just practice. Good luck and sorry I can’t be more helpful! The best way to fry / reheat /serve egg rolls when you aren’t going to serve them for several hours? Is room temp OK? Best way to prep if not serving until the next day. Great food website. Hi Barb, I wouldn’t leave the chicken at room temperature for several hours instead I would fully fry the egg rolls then refrigerate. To reheat, bake at 450 degrees on a lightly greased, foil lined baking sheet until warmed through. Hope this helps! HI Jen, These were SOOO delicious my family asked me to make them twice last week. 🙂 I like the fact that they’re not time consuming to make. Made them for my Bible study Potluck and they were a huge Hit!! Twice in one week – then you know you have a hit, that is awesome! I actually made these for Patrick’s birthday last month at his request – one of our favs too! Thanks so much Therese, I hope you have a fabulous week! I’ve been looking for recipes for a cocktail style Holiday party, and this is inspiring! I plan to make these egg rolls mini in size…..